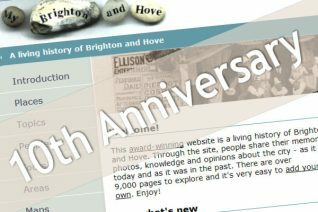 2010 is a very important year for My Brighton and Hove – it is our 10th anniversary. And – on 23rd of March we were proud to publish our 10,000th page. The My Brighton and Hove that we all know and love came about because of a project started in 1995. 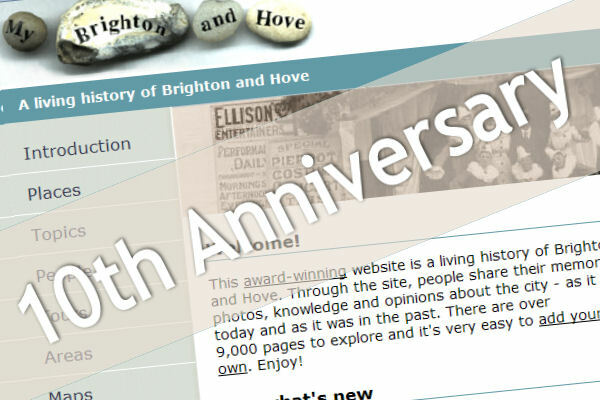 The brief for creating an interactive exhibit about Brighton’s history was put out to tender and won by local multimedia company Desktop Display and multimedia designer Jack Latimer. Their concept was to create a history of Brighton based on ‘personal tours’ created by local people. Hence the name of the project – My Brighton. Individuals, ranging from a schoolchild to a taxi driver, were given cameras and asked to create their own tours of Brighton. The resulting material was used to create an interactive CD. The tours revealed both the serious and the amusing sides of Brighton, and provided jumping off points to historical material such as related stories and galleries of images. In order to make the material accessible to all, 60 volunteers started work in 2000 on converting ‘My Brighton’ CD onto the Internet. The rest is history. As we are all well aware, ten years on we are a city not a town, and many changes have taken place in that time. The volunteer team here at MyBH thought that an appropriate project for this anniversary year would be a collection of ‘personal tours’ of the city entitled ‘My Brighton and Hove 2010’. Each of our participants will be featured in a unique 10th anniversary section on the website. They will introduce themselves and then take us on their personal tour. When the tours are published we hope that you will join in by telling us about your memories of the places on show. I have been looking through the streets and can’t find a mention of Beaconsfield Villas. Why not? What a great idea with the diverse cross section we should be looking forward to a huge increase in “rememberings” replies. I have a few about hop-picking. I’m surprised nobody has written anything about Beaconsfield Villas. So I will have a go. I was born there in August 1935. At the age of 4 I remember falling down the stairs at No 48. Also we had big stone lions either side of the front door, on the pillers we had big pineapples and iron railings and a wrought gate. When I was 5 a workman came and cut them out and took them away for the war effort so my dad told me later. I think I remember trams going up and down the road. What I do remember is when the trolleybuses started they smelt lovely and new. We moved away in 1940 to Reading and our house was taken over by the Army Officers. After the War we moved back to 48. I could go on but I think it might bore you. Dear Roger, nothing is boring when you relate your walk down memory lane. Check out what a group of us kids from the original Mile Oak estate did, after many of us related our walks down memory lane. Please do write more details of your childhood life in Brighton. You will encourage others to join in who also lived in your neighborhood. A reunion is the most fun at our age…… and memories…time stands still. I am trying to research Beaconsfield Villas also. I was born at the Beacon Maternity Home at 12/14 Beaconsfield Villas in 1948. I can find nothing about the maternity home and would be grateful for any info about the place. A Mrs D Preston ran it according to a street directory in 1949.